The RCMP say they've snared a man they allege was preparing to pass along classified information about Ottawa's massive shipbuilding program to China. In what seems like lightning speed in an espionage case, the Mounties arrested Toronto resident Qing Quentin Huang after learning only last Thursday, Nov. 28, that someone was going to sell sensitive information to the Chinese. RCMP arrested Huang, a Canadian citizen, on Saturday afternoon. It's not clear exactly what information Huang is alleged to have offered about the $34-billion Canada National Shipbuilding Procurement Strategy, a program to provide new vessels for the Royal Canadian Navy and Canadian Coast Guard, as well as new ice-breakers and scientific research ships. 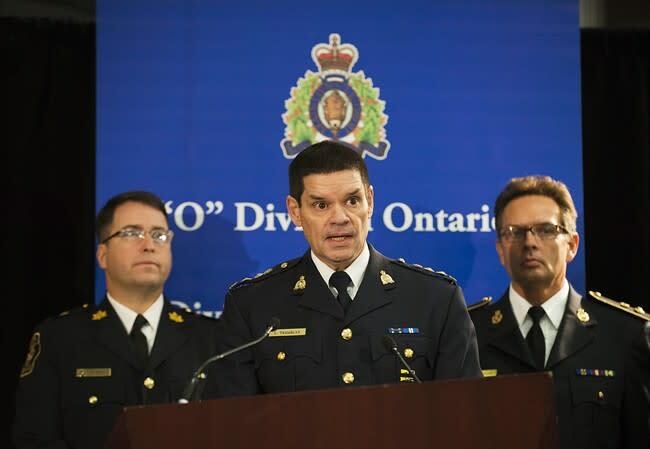 “In these types of cases, sharing of information may give a foreign entity a tactical, military or competitive advantage by knowing the specifications of vessels responsible for defending Canadian waters and Canadian sovereignty,” RCMP Chief Superintendent Jennifer Strachan, the force's Ontario chief of criminal operations, said in a news release. The Globe and Mail reported Huang, 53, worked as an engineer at Lloyd's Register Canada Ltd., a subcontractor to Irving Shipbuilding Inc., which is building the combat vessels included in the program. Integrated National Security Enforcement Team, which includes the Mounties, Canada Border Services Agency (CBSA) and the Canadian Security Intelligence Service (CSIS), led the investigation, dubbed Project Seascape. The Toronto Police Service and Ontario Provincial Police were also involved, the RCMP release said. The Canadian Press reported Huang made a court appearance Sunday morning and was scheduled to be back in court on Wednesday. He faces two counts under the Security of Information Act, a post-9/11 piece of legislation, of attempting to communicate to a foreign entity information that Canada was trying to safeguard. This is the first major spy case since Jeffrey Delisle, a naval officer working in a Halifax intelligence facility, was arrested last year and convicted of passing along top secret information to Russian military intelligence. He was sentenced last February to 20 years in prison in a case that damaged Canada's reputation for safeguarding secret information because Delisle had access to intelligence data from Canada's NATO allies. There have been warnings for years that Canada is an important target for Chinese espionage, including industrial spying, though the Chinese government stoutly denies that. A Canadian journalist working for China's official Xinhua news agency claimed last year he was asked to spy on the Dalai Lama during his visit to Ottawa, CP reported. Mark Bourrie claimed last year that Xinhua's Ottawa bureau chief, Dacheng Zhang, wanted him to use his parliamentary press pass to get into the Dalai Lama's news conference and turn over all notes and materials without writing a news story. Zhang denied the claim. Many in the intelligence community regard the Xinhua, which was created by the Chinese Communist Party in the 1930s, as a front for espionage operations. The news service came under scrutiny in 2011, when it was revealed Shi Rong, its Toronto correspondent, had a close friendship with Toronto-area MP Bob Dechert. The married Dechert, at the time a parliamentary secretary for foreign affairs, sent flirty emails to Rong. Dechert apologized but did not resign from his parliamentary secretary position, while Rong left the country. And in 2005, former Xinhua correspondent Haiyan Zhang, who'd gained Canadian citizenship and gone to work for the government, was dismissed after concerns were raised she was engaged in intelligence gathering for a foreign country. Zhang worked as a communications analyst for the Privy Council Office, which is the federal cabinet's powerful administrative hub. CSIS recommended Zhang be denied Top Secret security clearance, claiming she'd been suspected of intelligence gathering while working at Xinhua and had retained contact with Chinese spies, the National Post reported in 2011.